The 2020 Tacoma is here, but you need to take a good look at it to spot the changes compared to the 2019 model. Toyota adopted a cautious approach when updating the styling of its mid-size truck. Basically, besides the new grille and wheel designs, smoked taillights, as well as the sequential LED headlights on the TRD Pro version, the pickup looks identical to the current model. Not that we were expecting anything radical; after all, it’s not a new model but rather a facelift for the Tacoma — after all, it’s been America’s best-selling mid-size pickup for 14 years running. The updated Tacoma offers more than 30 configurations in six model grades: SR, SR5, TRD Sport, TRD Off-Road, TRD Pro, and Limited. All models above SR5 gain a new, 10-way power adjustable driver seat with power lumbar support, as well as an upgraded 8-inch touchscreen display (the base SR gets a 7-inch screen) and audio system. Additionally, a new LED bed lamp is available as an option on all models. The new multimedia system comes with Android Auto, Apple Carplay, Amazon Alexa and SiriusXM capability. The SR5 also gains an updated fabric design on the seat back and optional DRL headlights. Moving on to the Tacoma TRD Sport, it adds Passenger Smart Key entry, chrome taillamp inserts, and new LED fog lamps. The Tacoma TRD Off-Road also gets those and available Multi-Terrain Monitor (MTM) and LED headlights. As for the Tacoma Limited, it features standard LED DRL and LED headlamps, chrome taillamp inserts, 18-inch alloys, the upgraded Smart Key operation on the passenger door, and the Panoramic View Monitor (PVM). The TRD Pro also gets several updates for the 2020MY. On the outside, it comes with new sequential LED/DRL headlamps, LED fog lights, redesigned 16-inch wheels and black-insert taillights. The new wheel model is 4.188 lbs (1.9 kg) lighter than the previous version and is shod with Goodyear Wrangler All-Terrain Kevlar-reinforced tire. Furthermore, TRD updated the tuning of the Fox 2.5-inch internal bypass shocks and front and rear springs. Inside, the TRD Pro gains all the other updates of the lesser models. The 2020 Tacoma continues with two powertrains: a 159hp 2.7-liter four-cylinder and a 278hp 3.5-liter V6. Both feature a standard six-speed automatic transmission, with the V6 also offering a six-speed manual. 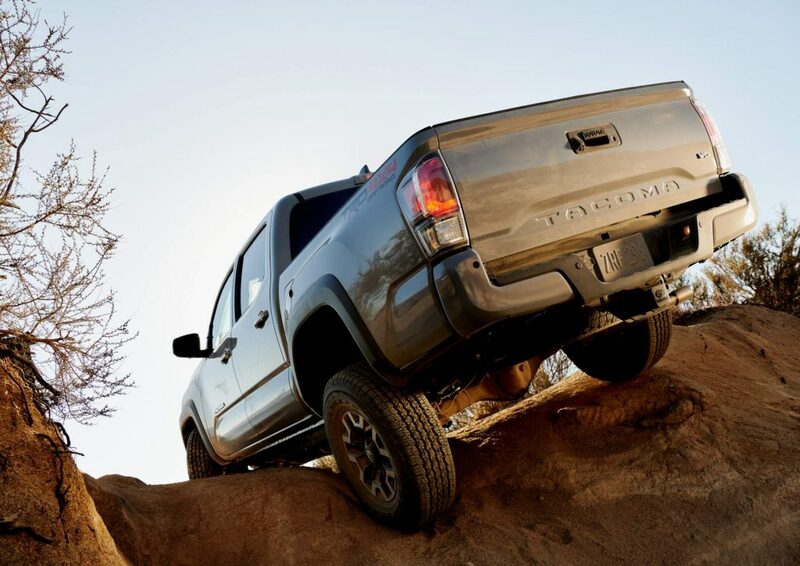 All Tacoma models come equipped as standard with the Toyota Safety Sense P (TSS-P) suite that includes Pre-Collision System with Pedestrian Detection, Lane Departure Alert with Sway Warning System, Automatic High Beams and High-Speed Dynamic Radar Cruise Control (DRCC). Its official debut will take place later today at the Chicago Auto Show, when we might get more info concerning the launch dates and pricing, so stay tuned.